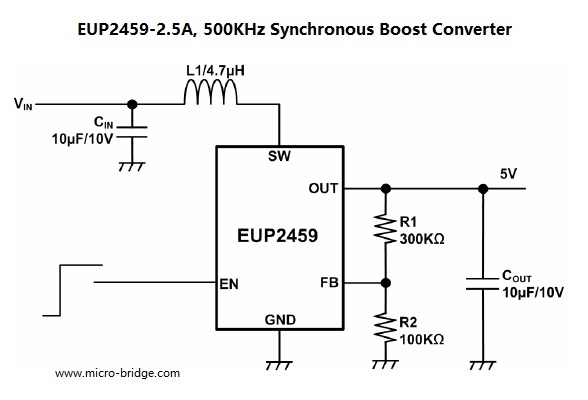 The EUP2459 is a compact, high efficiency, fixed frequency, synchronous step-up converter. The 500KHz switching frequency allows for smaller external components producing a compact solution for a wide range of load currents. High efficiency is accomplished by integrating the low resistance N-Channel Boost switch and synchronous P-Channel switch. All compensation and protection circuitry are integrated to minimize external components. The 500KHz high switching frequency allows smaller inductor and output capacitor, making the EUP2459 ideally suited for small battery-powered applications and saves PCB space. During shutdown, true load disconnect between battery and load prevent current flow from VIN to VOUT, as well as reverse flow from VOUT to VIN, which will extend the battery life greatly. The EUP2459 contains thermal shutdown function and cycle-by-cycle current limit to protect the device in the event of an output short-circuit condition. Built-in soft-start circuitry prevents excessive inrush current during start-up. The EUP2459 is available in a Pb-free, SOT23-5 package.